We’re going Balaclava crazy here. Maybe because we’re still enjoying the Yesterday channel’s Colditz fest. Maybe because it’s bally cold out there chaps, what? Sir – So many ladies are anxious to show a little thoughtful kindness to our soldiers. I beg to suggest that they can do this by knitting a woollen cap known as the “Balaclava helmet”. Having been asked to knit one for a brother in the 83rd Field Battery of Artilliery, I would like to know that each man enjoyed the same small luxury. Maybe the Artillieryman’s Daughter knitted a hat like this. M.Elliott Scrivenor’s Knitting and Crochet Book was already in its Third Edition by 1903.Victorian and Edwardian patterns are notoriously eccentric but this was unusually easy to follow and unambiguous. The original was knitted in the long defunct Paton’s 3 Ply Wheeling. I made it in 5 ply gansey wool from British Breeds. Handily, they do a khaki. I alternated that with gansey dark blue. It is 100% pure wool and the beauty of British Breeds is that they sell in 50g balls so you don’t need to buy a 500g cone or mega-skein, to make a small thing. The original pattern specified dark grey and A.N.Other lighter colour. I chose it because it was an intriguing top down construction – very modern. The increases at the top don’t look pretty but serve their purpose. But beware – that wide rib (8 purl, 4 plain) grows like crazy! The pattern did specify a tension (6 st to the inch), and I knew I could get that on 2.5mm needles. Despite getting it, the thing turned out big and baggy – so if I put this pattern out, I will do a slight re-write, to compensate. (Although the men in this family do have curiously pea-sized heads). Took me 3 evenings to knit, pretty well. The sizing was so uber-generous and I’d knock one 12 st repeat out of it, if I knit it again. I’d imagine my 5 ply was a thicker grist but as I achieved the right tension, and it’s a wool I have used before and performs well, I wasn’t overly concerned. Another reason I chose this one was, it is stripy. Less of the terrorist/gimp associations about it! I wanted Mr H to be warm at work (he’s sometimes a WW2 A.R.P warden – don’t ask). So unbelievably, it will actually get worn. Or would have, had it not turned out large and slightly baggy. A sizeable family of hedgehogs could hole up for the winter in it. A few tweaks and this pattern would be entirely usuable though and I like the ‘comforter’ attached. You have to be careful to knit it in non itchy wool, though! The original 1903 book was illustrated with photographs – probably groundbreaking for a knitting book of that date..? I found myself thinking I hope the poor bloke in the photo there didn’t end up on Flanders Field… Am sure this balaclava remained the style upto WW1, though. 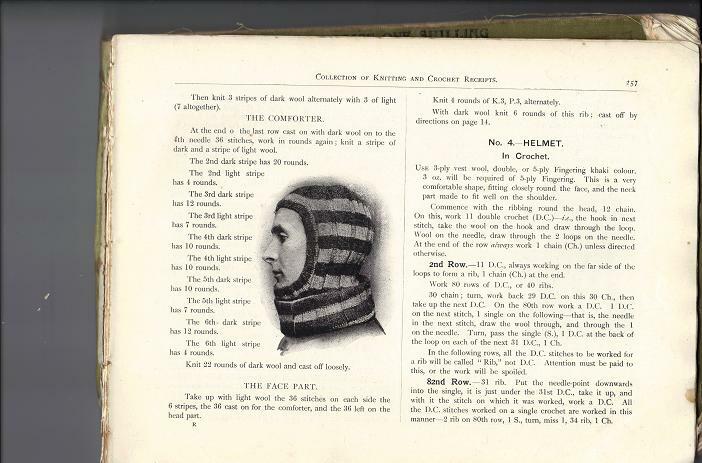 I looked at other balaclavas including the one in the classic Paton’s Woolcraft books but most of them post WW2 seem to have been knitted flat so have an ugly sewn-up seam and rather unexciting construction. I now decided I wanted to knit him an actual WW2 one. By some stroke of great fortune, a new and rather wonderful vintage shop just opened in York; the Vintage Emporium, 18 Fishergate, York, YO10 4AB. We only discovered it because St George’s carpark was flooded a couple of weeks back, so we had to find a different way into town and amongst the treasures there, were some nice knitting pattern books. 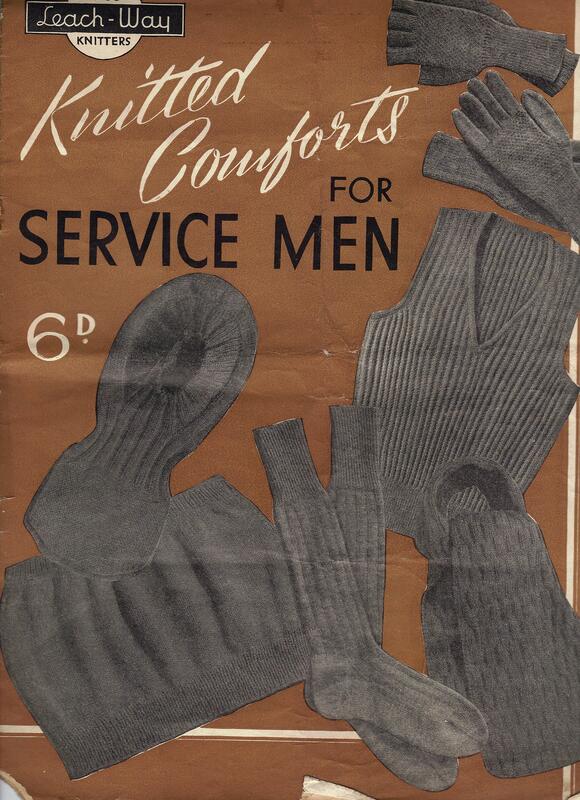 I found a 1940’s pattern from ‘Knitted Comforts For Servicemen’. Straight away, just looking at it, you can see how the balaclava evolved. It seems every yarn company was vying for the war effort knitters. So there are still large numbers of WW2 vintage pattern books and leaflets out there, published by various woollen mills. These are going to get increasingly hard to track down. I have spent years collecting James Norbury’s 1950’s knitting books – and even tracked down Elizabeth Zimmermans years before she was even heard of in the U.K, thanks to a mention by the Knitting Bishop. And just realised the big gap in my collection are the 1940s’ patterns. With these patterns, gone are the Edwardian and Victorian ambiguities. Things are starting to feel more standardised by the 1940s. Here’s today’s progress on the 1940’s balaclava. Structurally, quite different. Knitted bottom up, and you knit the Front and Back flaps first, join, do 3 X 3 ribbing for a bit, then work your way up from there; decreasing at the top. Be careful if buying on Etsy that you’re buying an original pattern, not a reprint. Unless you don’t mind, of course! Last night’s episode of Colditz saw the beginning of the wartime balaclava. It looks to be smaller and snugger and in theory should be a faster knit. 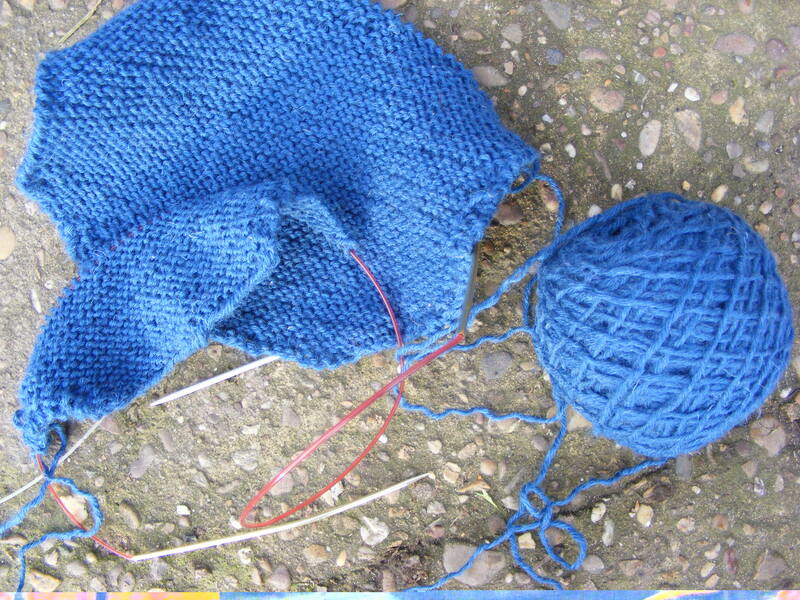 Again, I’m using British Breeds yarn – but in a now defunct shade of blue. I had forgotten how much I fancied David McCallum and – more disturbingly – Anthony Valentine. Here’s dad at the start of the War. I’d imagine this was taken for my grandad to keep a copy on him, wherever he went. He went to some hellish places: London in the Blitz, Belgium, and later, amongst the troops liberating Belsen. If he had this photo, it will have meant the world to him. The day after War was declared, his father (a sargeant in the T.A), left to fight. Aged 12, dad had to leave his place at Leeds High School immediately to help my grandma, Lillie, run the dairy. He was an academic little kid, and disappointed to leave school. 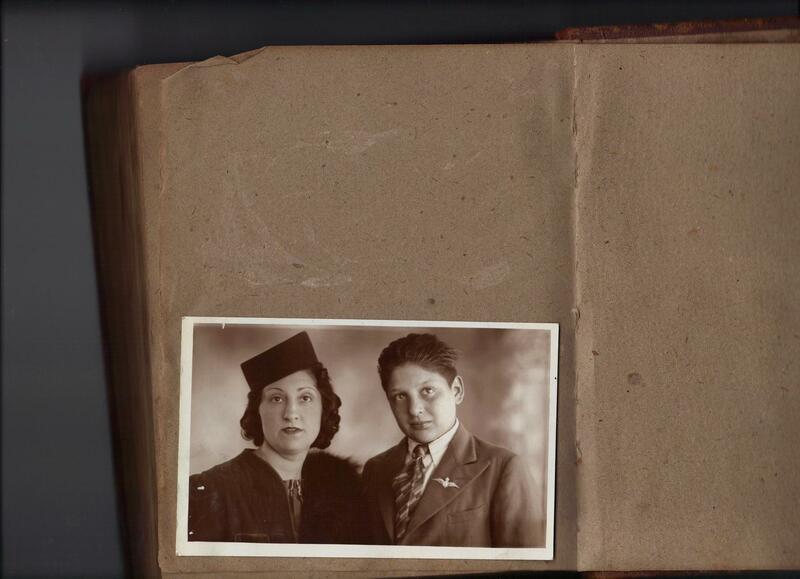 When he was 17 in 1943, he joined the Paras and was posted to India, Egypt and then Palestine. So he didn’t come home til 1947. He was demobbed at Imphal Barracks in York, and returned home to Leeds. His father – who had seen him for the space of one hour in Trafalgar Square during the War when they were both on leave – walked right past him at Leeds station, not recognising him. His mother knew him instantly. In which one of the Thompson brothers gets handy with a gun, back in 1836. One for the genealogists and historians today! Knitters beware – the balaclava is coming on apace. And will be blogged very soon! Some time back, I wrote about my American relatives in Illinois, being victims to an accomplished horse stealer, in 1853. Back in 1836, the same thing was happening home in Yorkshire, to the Thompsons. To set the scene, the story happened to John Thompson, born in Wistow, Yorkshire. He had two older brothers – William, and Charles. William was my great grandad X 3. The Thompsons were an old farming family. My mother’s was the last generation of Thompsons to be born on a farm, after at least 600 years of solid farming tradition, according to parish records. The newspapers never name ‘the brother’ so we can assume the gun-toting Thompson may have been either William or Charles. For the purpose of this story, I’d like to imagine it was my William – as Charles goes on to glory of a very different kind, anyway. Back in 1836, Charles had a son – another William (we do that to annoy you!) – who would have been 20 when this happened. He was to emigrate to California in later life, and along with his son, and they developed the famous Thompsons’ Seedless grapes (sultanas to you and I!) Over 90% of the world’s grapes are, to this day, Thompson’s Seedless. Apparently. I wish we got royalties. Charles stayed home in Yorkshire, and we often wondered why he had a plush marble gravestone when parish records had him down as farm labourer. The mystery is now solved. The $$ must have been sent home from California. Charles lived well into his nineties. From “THE YORK HERALD”, Saturday March 5th, 1836. ELIJAH YOUNG (36), and Wm. YOUNG (54), two brothers and gypsies, were charged with stealing a bay mare, the property of John Thompson, farmer, of Wistow. MR.ARMSTRONG, for the prosecution, and SIR G.A. LEWIN, for the defence. On the night of the 23rd of February, between ten and eleven o’clock, prosecutor’s brother was alarmed by a noise in the fold-yard. He got up, and on going out, heard some person urging the mare to leap over a hedge. He followed them, and saw the prisoners, one leading the mare, and the other, walking behind; the brother informed his brother, and took with him a gun. When he got up to the men, he told them he would take them, and seized William with one hand, and held the gun in the other. Elijah was coming back to assist his brother, when prosecutor’s brother threatened to shoot him if he moved. Prosecutor came up, and witness knocked one of them down, and gave them into the charge of his brother, whilst in that position, and then run after Elijah, with whom he had a severe struggle, but ultimately succeeded in capturing the two. Witnesses were called as to the prisoners’ character. Guilty – to be transported for life. I went in search of Elijah and William, knowing the Australian records are often searchable from anywhere in the world. The New South Wales state records have a searchable database of over 120,000 convict records. Elijah Young sailed on the Moffat in 1836. There is a record of his Ticket of Leave in the Windsor district. We know it’s our Elijah as the record says he had been tried at York. William also sailed on the Moffat and his records show Tickets of leave “on the recommendation of the Windsor Bench”, and a Certificate of Emancipation. Which means both men survived the ordeal of the transport, and later, their time as convicts. By no means a foregone conclusion. prisoners did not appreciably suffer in consequence. As the men were transported, Elijah’s wife gave birth to his baby, at Wistow Lordship. I have found no evidence of her joining him in Australia. Life must have been incredibly hard for Elijah’s wife, left alone on Wistow Common with a baby and maybe older children. Like many of the romani in this area, she would have worked as a day labourer on the farms. Lifers were as good as dead, legally, home in England. This did not leave their wives free to re-marry, but it seems to have left them free to re-marry at the other end of the world. But the men had it lucky. In the very same gaol delivery, were two Cawood men (next village along), one of whom was sentenced to death for stealing two £5 notes. The Thompsons’ bay mare was probably worth a comparable sum. Several years on, Wistow hit the headlines again when my two great uncles were banged up for incendiarism. One got the death sentence and with just days to go, in the death cell at York Castle, got his sentence commuted to transportation. More of him another time! But he also left a pregnant wife behind and the child grew up, never having set eyes on her father but still naming him, on her wedding certificate, twenty years later, as if he was just down the road! Luckily for us, the Aussies are great at digitising newspapers and making them freely available online. I didn’t find much trace of William, but found some intriguing mentions of Elijah. According to The Sydney Morning Herald of 9th June, 1849, Elijah was granted a conditional pardon on May 1st, 1849. This was conditional on him staying in Aus, and would be null and void if he returned to England. Before long he was back in trouble, though! The Undersigned hereby offers the above Reward for the apprehension of ELIJAH YOUNG, a Gypsey, of the following description, Viz – height about five feet nine inches, stout, very dark complexion, black hair, formerly assigned to Mr Fitzgerald Windsor, and once lived at Bathurst..
York Reference Library also has a searchable database of York convicts. Both Elijah and William can be found there, with the date of their trial (27.2.1836). 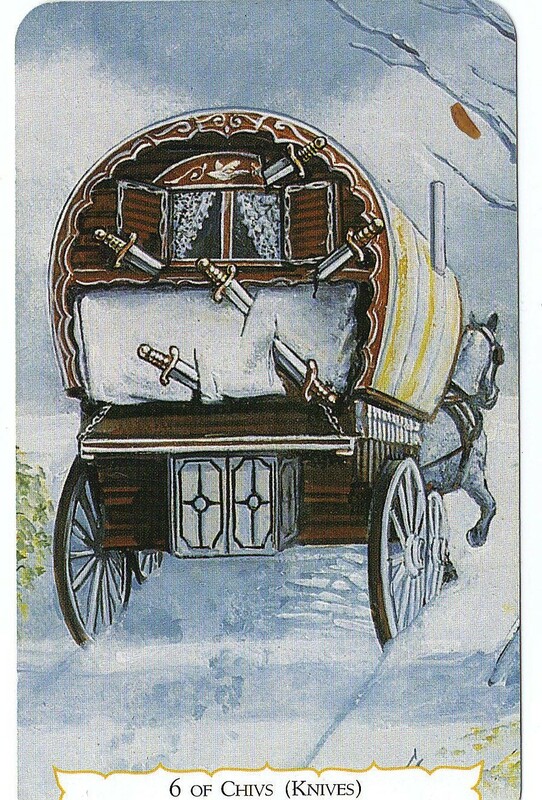 Images: 3 of Chivs (knives), 5 of Chivs, The Buckland Romani tarot. The three of knives traditionally means “heartbreak”. 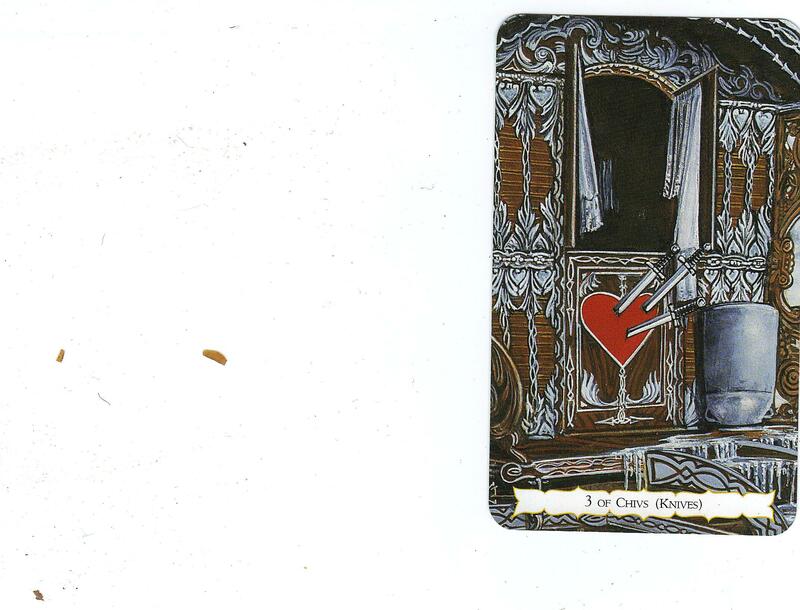 You can see images from this deck here. It’s still OOP, so not easy to get hold of! Here it comes again! 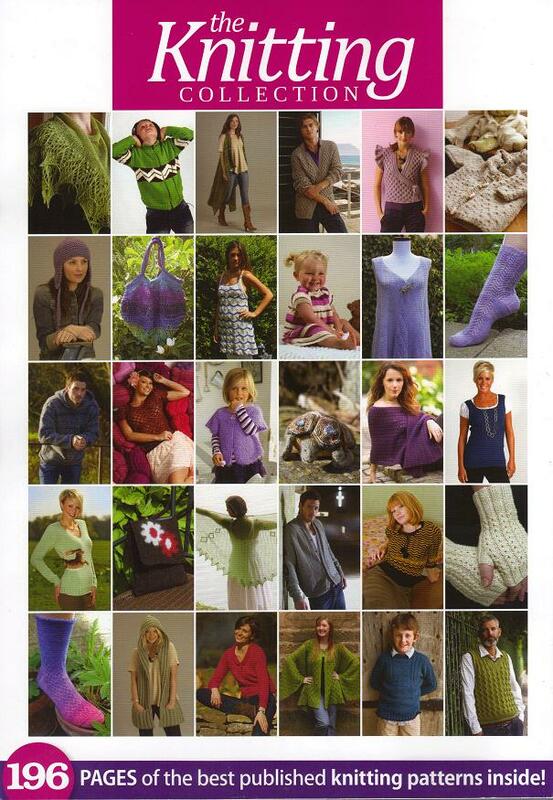 ‘Sunk Island’ (my Humber/Ouse kids’ gansey) has just been re-published in ‘TheKnitting Collection 2’. Available from W.H. Smiths or via Yudu. You can see it on the back cover, in rather nice company, bottom row. It’s second from right. No 5 son thought it a bit surreal as when we picked this up in Smiths, he’d been wearing it the day before! 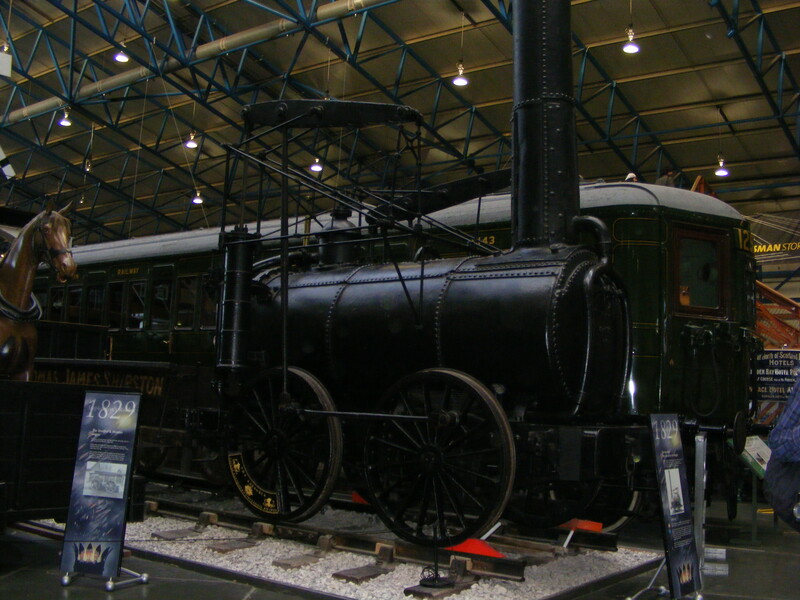 This weekend we did the National Railway Museum here in York on Saturday, and Eden Camp on Sunday. At the Railway Museum, we particularly enjoyed the steam-punk. Worser Half pointed out this engine was already 4 years old when the Stillingfleet Tragedy happened in 1833. We think of it as some lost, bucolic age but of course, the machines were already here! Eden Camp was a POW War camp in WW2, near Malton. Well worth a visit but pick a warm day! The entire museum is spread out over 28 or so of the original POW camp huts. The whole thing finishes with a pre-fab, ‘Home Fit For Heroes’. 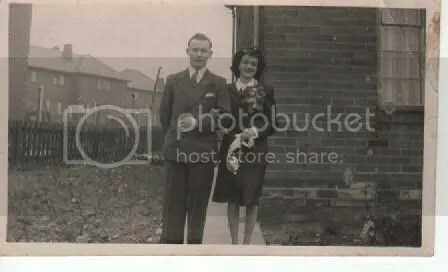 Here’s my Auntie Margie moving into her brand new home, post War, with her hero, Uncle Syd – he’d been a sailor in the War. These were the ‘homes for heroes’ that went up in our village, at the end of the War. Just up the road there were some pre-fabs too. That garden, just bare soil, was to become a vision to behold in the years that followed! Eden Camp had a little knitting on display, on the dummies (‘Autons‘ as my No 4 calls them), but what with the lighting, and camera shake of No 3, am afraid I have no informative photos to share with you! It did strike me that most of the knitting (cardis etc) were done in surprisingly chubby grist yarn (DK on the whole), and probably on something close to 4mm needles. On Saturday night we saw the original ‘The Colditz Story’, and sure enough many of the actors were wearing jumpers of a similar style and grist. You can see Sir John Mills in one, here. Quite coarse knitting, really, compared to the stuff of just a generation or two earlier. All this 1940s’ knitting makes me want to knit a balaclava! Worser Half and I were saying that we sometimes forget, us products of the Baby Boom were born only 15-20 years on from WW2. I vividly recall the still uncleared bomb sites in Leeds when I was a kid. Tatters of net curtains at upper windows, and 1940s wallpaper and older plaster peeling off interior walls… And much of our mothers’ knitting in the early 60s was still, essentially, the wartime knitting they grew up with. 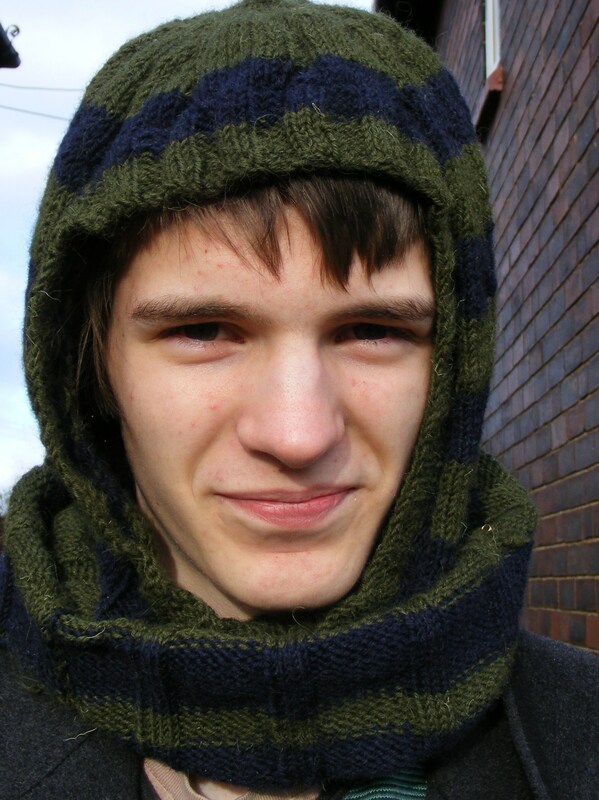 I remember – as many people our age do – one winter mum knitted me this hideous balaclava and insisted I wear the bloody thing to school. I ached to take it off my head, that woolly little helmet-shaped thing. But didn’t dare til I was out of her eyesight. The second I was waved off at the school gates, I whipped that thing off. Til next time, gentle reader, let me keep you warm with this from what I think might be the forerunner of the famous Patons’ Woolcraft books. M. Elliott Scrivenor’s 1903 “Knitting & Crochet Book”. 1903 Balaclava: click to enlarge. If you dare.